The Romanian coastline of the Black Sea is between Midia head at the north and Old Vama at the south, having a length of 245 km. On the Romanian coastline there are more than 150.000 of seats for hosting in hotels ,boarding houses and country houses. placed on the length of the european road E 87 , the stations of the Romanian coast line are: Navodari, Mamaia, North Eforie, South Eforie, Neptun-Olimp, Venus, Saturn, Old Vama, 2nd May, Mangalia, Techirghiol and Costinesti. In this moment , the Romanian Coastline is in a competition with the Mediteranean coastline, being famous for his high quality, soft dust. The Black Sea has a low saltness compared to other continental seas, and , allows the tourists to swim under the water in good conditions . The seaside is extremly scanty. But it exists some extensive zones of 100-200 m where the water doesn't pass 1-1,5 m, so that the risc factor will be reduced . The southic zone of the coastline is frecventated by tourists even in the ending of the XIX century. Starting with 1959 the stations of the coastline have been permanent modernized: Mamaia, Eforie North, Eforie South, Teghirghiol, Costinesti, neptun, Olimp, Aurora head, Venus, Saturn, Mangalia are the favorite destinations of the tourists from everywhere. In this moment, the capacity of hosting of the coastline is of aprox 150.000 seats. Famous for a vacation festivals dedicater to the teenagers, Costinesti is situated at 31km south from Constanta, near the Costinesti and Schitu villages. Those had been created at the end of XIX century by the german colonists. The watering place has been contructed in 1949, when it was arranged for the first camping vacation for kids. Arheologic obiectives to visit in the coastline are: Histria Stronghold situated on the seaside of the Sinoie lake, the ruins of cetatea Tomis and Callatis, the Arheologic museum from Mangalia, the history museum from Constanta, Moscheia from Constanta and from Mangalia, the church Saint Petru and Pavel from the hystoric zone of the Constanta City. The seaside of the Black Sea offers very good conditions of the tourisment vestival in order of the mineral waters, therapeutic muds offered from the lakes from the neighbourhood of the coastline : Techirghiol, Tatlageac, Neptun, Belona, Siutghiol, Corbu, Sinoe, Navodari and Tasaul. Vega Hotel is situated on a private beach in the popular Mamaia resort close to the Aqua Magic Parc. It offers elegantly decorated rooms, all with sea views. 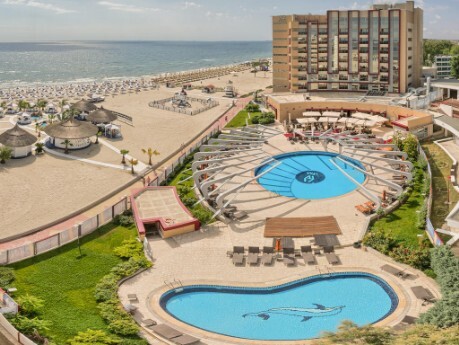 The Vega is only 10 km from from Constanta and 25 km from Mihail Kogalniceanu Airport. Bus stops are in the immediate vicinity of the hotel. The hotel features swimming pools and a gourmet restaurant. It serves Mediterranean, Asian and South-American dishes. Guests can start their day with a rich breakfast, enjoy light and varied dishes for lunch and a festive dinner. The Violet Lounge Bar is located on the hotel's top floor and serves fine drinks, snacks, aged wines, cigars and tea to the sounds of a saxophone or the piano. Cruises with lunch to Ovidiu Island are offered. You can visit the surroundings in the company of professional tour guides.